The latest figures from trade body WindEurope show a 15.8% fall on 2017's record annual total, when 3.15GW was added across 17 new sites. The UK installed 1.31GW of new capacity in 2018, down from 1.68GW added in 2017, however Ørsted's 1.2GW Hornsea Project One site is under construction — the first turbine was installed in January 2019. 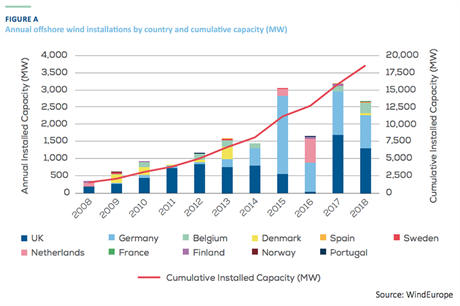 Germany meanwhile added 969MW last year, down from 1.25GW installed in 2017, but Belgium added 309MW, up from 2017's total of 165MW. 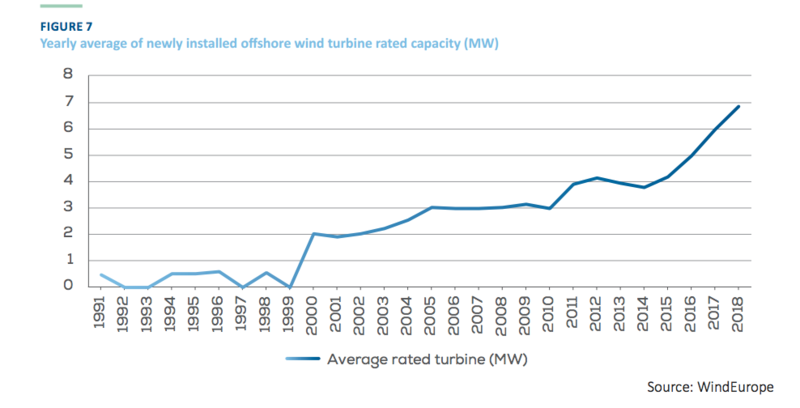 A noticeable increase on 2017 was the size of newly installed turbines. The capacity of machines added in 2018 averaged 6.8MW, 15% higher than the previous year. 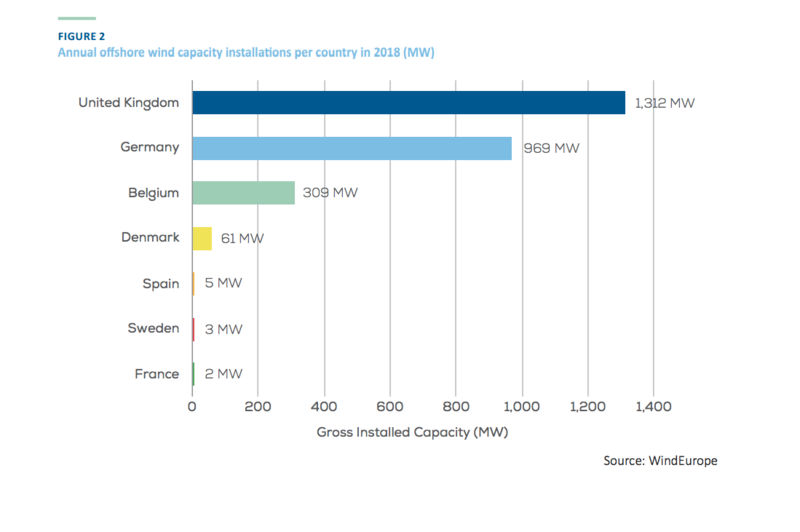 WindEurope noted the average rated capacity of newly installed wind turbines has grown by 16% annually since 2014. 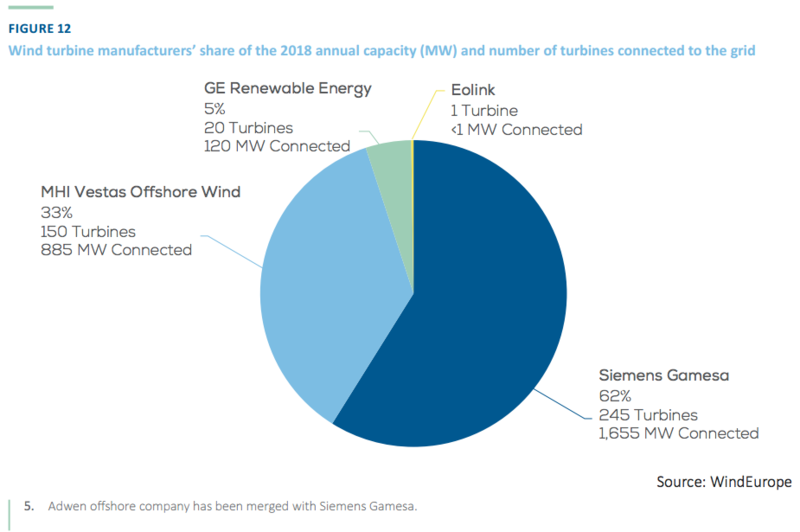 Siemens Gamesa Renewable Energy (SGRE) once again dominated the turbine supplier sector. It installed 245 turbines totalling 1,655MW in Europe last year. Nearest rival MHI Vestas had 150 turbines installed, equating to 885MW. Both manufacturers claimed 95% of the market last year. SGRE now holds a 69% market share of Europe's total offshore wind capacity, following the inclusion of the Adwen subsidiary. MHI Vestas holds a 24% cumulative share, while GE Renewable Energy currently stands at 1%.